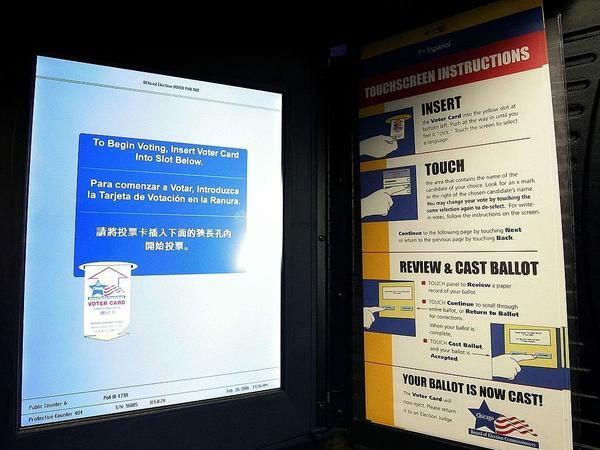 Instructions for electronic touch-screen voting machines in Illinois in 2006. Vote flipping. The stories and conspiracy theories have begun. In every recent election, there have been reports of voters pressing one candidate's name on a touch-screen machine, only to have the opponent's name light up instead. It can be unnerving for voters and often leads to allegations that the machines have been "rigged" to favor one candidate over another. Enter election 2016, when the word "rigged" is more politically charged than ever. In the first few days of early voting, there are already scattered reports of vote-flipping machines in North Carolina, Texas and Nevada. The North Carolina chapter of the NAACP sent a letter to the state's board of elections Monday after voters complained that machines had flipped votes in five counties. The group noted that, in each case, the voter was able to correct the error before the ballot was cast. But it asked the board to remove malfunctioning machines and to post signs reminding voters to check their ballots before submitting them. The board replied that it takes the concerns seriously and advised voters to double-check their ballots. It said the machines were tested before the election and are recalibrated each day before voting begins. And, if needed, problem machines would be taken out of service. In Texas, a handful of voters in at least three counties reported that they had selected straight Republican tickets, only to have Clinton/Kaine pop up instead of Trump/Pence. Local election officials blamed user error and said there was nothing wrong with the machines. There were similar reports in Clark County, Nev.
That led some groups worried about vote-rigging to take to social media to warn voters to ask for paper ballots instead of using touch-screen machines. "I knew this election would be stolen," read one comment on Breitbart.com, a conservative website that until recently was run by Donald Trump's campaign manager, Stephen Bannon. "People need to go to jail for this crap," read another. Election officials in Louisiana and Georgia warned voters on Tuesday not to believe everything they see on social media and that they have seen no such problems in their states. They said they don't want people to be discouraged from voting. So what's going on? Are the machines rigged? No, says just about every voting technology expert. "If you were actually trying to rig an election, it would be a very stupid thing to do, to let the voter know that you were doing it," says Larry Norden, with the Brennan Center for Justice in New York. He notes that one reason voters are so concerned about vote flipping is that they see it happen right in front of them on the voting machine screen. They press A and B lights up. "I do think if somebody was hacking into a machine they wouldn't do this, to kind of notify the voter that the machine wasn't working," he says. Norden thinks the real problem is that voting machines used in much of the country are old, more than 10 years in most places. The machines rely on outdated technology — some of it is from the 1990s — to calibrate the touch screens. And the hardware is starting to wear out. "Over time, as people vote, that calibration becomes less and less accurate," says Norden. So by the end of a long day of voting, the machines aren't as accurate as they were in the morning. Also, the sealant that attaches the screen to the machine can deteriorate over time, which causes the screen to be misaligned. Voters can usually change the selection to the right one before their ballot is cast. If not, they can let a poll worker know there's a problem so they can move to a machine that works. In many places, such machines also have paper ballot backups, if there's ever a question about the vote. Of course, another problem can be human error. A voter might think they're touching one box, but accidentally touch another. Even long fingernails have been blamed for such mistakes in the past. Two machines were already removed from an early voting site in Mecklenburg County, N.C., after complaints of vote flipping. Officials say technicians were unable to duplicate the problem. Norden says voters will probably see more of this in the days to come, and he's worried about it causing long lines at some polling places if machines are taken out of service. But he's more worried about the impact of rumors that vote-flipping is widespread and part of some conspiracy, when in reality, it's a problem that's easily fixed and fairly confined.